Donn Chappellet, one of Napa Valley’s true pioneers, passed away on May 22 at 84. Inspired by the great wines of Bordeaux he admired so deeply, Chappellet found his true calling atop Napa Valley’s Pritchard Hill, a region whose potential he was the first to champion. Sadly, I never met Donn Chappellet, I only knew him from his wines, Cabernets that remain among my personal favorites. Donn and Molly Chappellet bought the core of their hillside estate in 1967 on the advice of André Tchelistcheff. Two years later, a young Philip Togni made Chappellet’s 1969 Cabernet Sauvignon, which went on to establish itself as one of the truly iconic, legendary wines of Napa Valley. 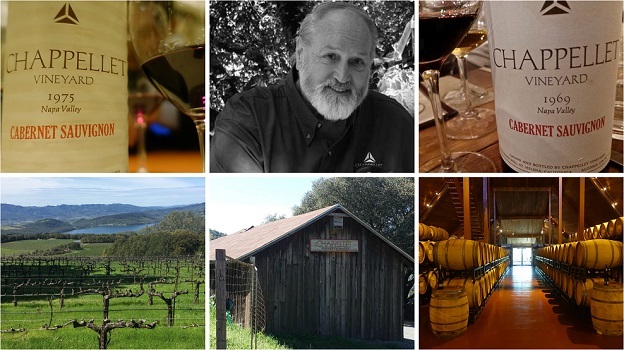 A succession of talented winemakers followed, including Tony Soter, Mia Klein, Cathy Corison and Phililp Corallo-Titus, all of whom cut their teeth at the large, barn-like winery that was built in 1967 and is still in use. Hillside vineyards are all the rage in Napa Valley today because quality minded producers can command high bottle prices and therefore offset the high costs of farming. But that was not at all the case in the 1960s, when the Chappellets had the vision and foresight to acquire their land. Pritchard Hill is now home to a number of world-class wineries, including Bryant, Colgin and David Arthur, along with a handful of emerging stars. None of that explosion of interest would have been possible without the Chappellets. The pace of change in Napa Valley is fast. A lot of people come and go. But the Chappellets have been making enduring contributions to the prestige of visibility of Napa Valley for six decades. There are few families that can match that track record. Donn Chappellet is survived by his wife, Molly, and six children, including Cyril Chappellet, who runs the winery today, along with a large extended family. All of us at Vinous would like to extend our condolences to the Chappellet family.